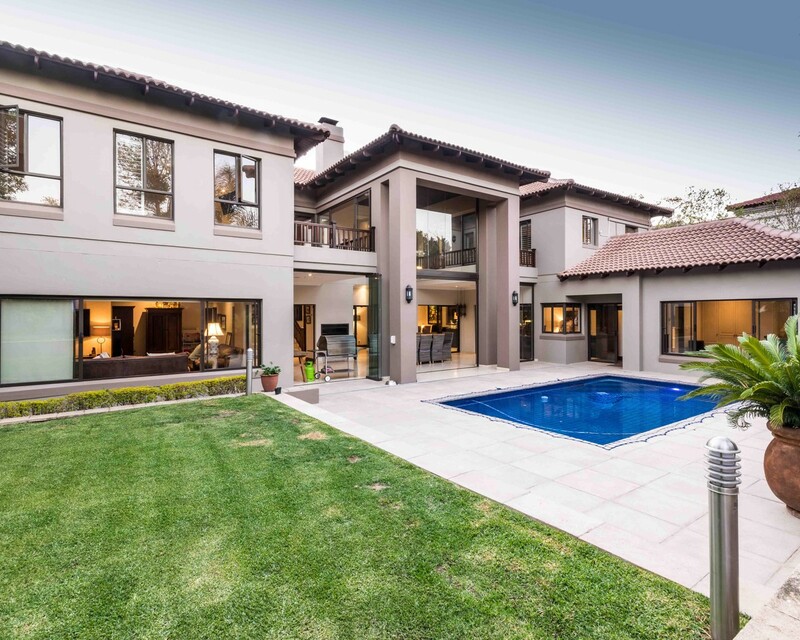 Sign up and receive Property Email Alerts of Houses for sale in Dainfern Golf Estate, Sandton. Imposing masterpiece in the heart of Dainfern. Two double garages flanking the home with a wooden walkway and water feature set the tone for this immaculate home. You are welcomed by an oversize front door leading you into a double volume entrance area. Being designed around being the ultimate entertainment home, you are visually drawn towards the large entertainment area with double height stack-away glass doors leading onto the swimming pool area with your own poolside cabana bar set upon a meticulously maintained and terraced garden. Strategically placed remote-controlled garden light arrangement allows for creating the needed ambiance and evening presence required. From the entrance area, you are flanked by a large formal lounge to your right with sliding windows to create the desired setting. To your left is the formal dining area with an additional informal dining/entertainment room with builtin braai adjacent to it. An impressive kitchen that opens up onto a private garden allows for ample natural light to enter the kitchen and leads to the family lounge. The kitchen comes with a large pantry and scullery. The home is designed around opening up towards the garden and pool area with the ultimate in privacy in mind. Downstairs is one ensuite bedroom that is currently being used as a home study. A second built-in study is on the first floor. Walking up the staircase, you are greeted by a balcony overlooking the garden with the master bedroom to the right offering an extra large bedroom with walk-in closet and bathroom. To the left is three additional bedrooms with ensuite bathrooms. The house caters for every conceivable need by having a standby generator, borehole, and water filtration system, ample storage, staff accommodation and even a dollhouse in the garden. One of the few homes in the estate where attention to detail is of the highest caliber. Malherbex Property Group endeavors to give you the most holistic property buying and selling advice. Contact us today to speak to one of our area specialists at 0652-000-000. Sign-up and receive Property Email Alerts of Houses for sale in Dainfern Golf Estate, Sandton.